China is in negotiations to build a high-speed rail network to India and Europe with trains that capable of running at over 200mph within the next ten years. Passengers will be able to travel by train fromKing& #39;s Cross to Beijing in just two days on trains that travel almost as fast as aeroplanes under ambitious new plans from the Chinese. The network would eventually carry passengers from London to Beijing and then to Singapore. It would also run to India and Pakistan, according to Wang Mengshu, a member of the Chinese Academy of Engineering and a senior consultant on China& #39;s domestic high-speed rail project. A second project would see trains heading north through Russia to Germany and into the European railway system, and a third line will extend south to connect Vietnam, Thailand, Myanmar and Malaysia. Passengers could board a train in London and step off in Beijing, 5,070 miles away as the crow flies, in just two days. They could go on to Singapore, 6,750 miles away, within three days. "We are aiming for the trains to run almost as fast as aeroplanes," said Mr Wang. "The best case scenario is that the three networks will be completed in a decade," he added. Mr Wang said that China was already in negotiations with 17 countries over the rail lines, which will draw together and open up the whole of Central, East and Southeast Asia. Mr Wang said the network would also allow China to transport valuable cargoes of raw materials more efficiently. Mr Wang said the route of the three lines had yet to be decided, but that construction for the South East Asian line had already begun in the southern province of Yunnan and that Burma was about to begin building its link. China has offered to bankroll the Burmese line in exchange for the country& #39;s rich reserves of lithium, a metal widely used in batteries. Currently, the only rail line that links China to South East Asia is an antiquated track built by the French in Vietnam a century ago. The Asian Development Bank has recently agreed a second £27 million loan as part of the £93 reconstruction of Cambodia& #39;s network, which should finish by 2013. The cost of the lines from Cambodia to Singapore and then from Vietnam to China could be roughly £400 million. "We have also already carried out the prospecting and survey work for the European network, and Central and Eastern European countries are keen for us to start," Mr Wang said. "The Northern network will be the third one to start, although China and Russia have already agreed on a high-speed line across Siberia, where one million Chinese already live." 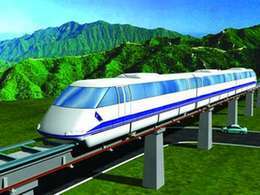 China wants the high-speed tracks to run on the same gauge as China& #39;s domestic network. Vietnam has agreed to change its standard gauge, but other countries are still in negotiations.